Lately, I’ve been feeling very casual; as you can tell from the picture above. I suppose it’s the in-between weather. My heavier suits are a joy to wear when the temperatures are in the 50ºF and below range. But these days that start out around 40ºF and end up flirting with 70ºF can be confounding to your daily wardrobe plans. In the photo above I am once again wearing clothing purchased a few years ago. It’s all cas (pronounced “cazh.” As in “Dress code? Dude, it’s totally cas.”) But I mean it to denote both casual and blended with cashmere. The herringbone jacket is by a company called Oliver and was purchased at Peter Blair during an end of the season sale. I wasn’t sure I could make a pumpkin spice coloured sportcoat work. It’s become a fall favourite. The sweater vest is B-Squared, charcoal cashmere. Sleeveless sweaters are very good layering pieces for these early fall days. Especially if you don’t take off your jacket. If you do, you run the risk of looking a little too “Jimmy Olsen, cub reporter” in my opinion. The navy tie is also B-Squared and is woolen knit. The trousers are Ralph Lauren cashmere (maybe 7%) blended with wool and carded to give them a nice soft, flannel-like hand. They are a houndstooth black and tan with a rust overplaid that plays nicely off the sportcoat and the houndstooth patterned shirt. Ancient Allen Edmonds Sandford model shoes round out the day’s choices. With the addition of a hat, it’ll be just warm enough for walking the three blocks to pick up my daughter. As the coat does not have surgeon’s cuffs (working button holes) I will be forced to take it off to carve the pumpkin this afternoon. But that will be in the privacy of my backyard. Consider adding luxurious fabrics to your daily wear and don’t be afraid of a little colour to brighten up your fall. This entry was posted in Elegantology and tagged Allen Edmonds, casual clothing, Oliver, Peter Blair, Ralph Lauren. Bookmark the permalink. Excellent advice! I have certainly taken it to heart this year. I work in a very drafty university building and I’ve taken to leaving several blazers and sweaters at work to make sure I am always appropriate and warm. For the first time, I’m layering at home too. It’s our attempt at eco-conciousness and frugality to refrain from turning on our heat until at least November. Greaat photo. I am hving a sport coat made in just about that color, and have been secretly worrying about how to pull it off. You have made my day. 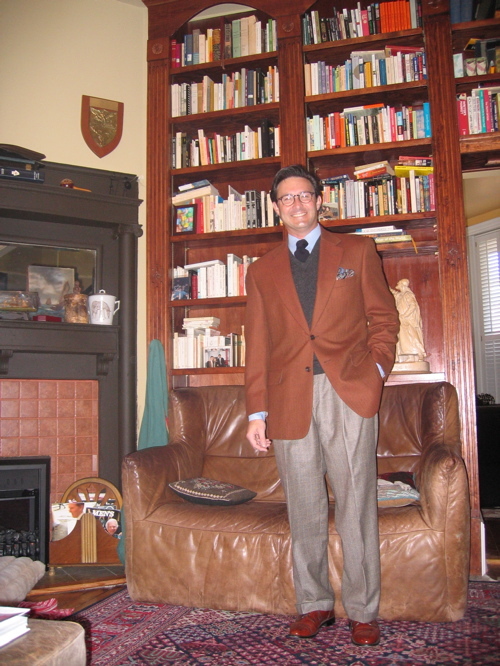 Years ago I HAD a cashmere blend sportcoat in that pumpkin spice color and loved it. Wore it all the time. Years later I am delighted to have found another. It’s a great color because it matches with grays, beiges, browns and greens but doesn’t look bland or lifeless. Great look Mr Elegantologist ! You really make it work without looking like a prof. Very nice. Nice use of a simple dark navy tie to keep it elegant. I grew up in a big, old, drafty house and layering was the key to keeping warm. You look marvellous and the sofa is divine, 70’s Italian? Fairfax, layering saved my life in Muncie, IN…. HOBAC, thank you. Good guess. It’s 70’s Dutch (Montis.) I can’t believe I found it in an antique store here in Richmond. It really is wonderfully comfortable, lightweight and, I think, very good looking.